Adobe Flash zero day exploited in the wild. Remote code execution vulnerabilities are hacker’s favorites! On December 5th, 2018 Adobe published security bulletin APSB18-41 for critical vulnerability CVE-2018-15928 in the widely used Flash Player. Gigamon Applied Threat Research (ATR) reported the vulnerability on November 29th, 2018 to Adobe. They detected the issue some days before while analyzing a malicious word document that was uploaded to VirusTotal from a Ukrainian IP address. For a detailed analysis of the attack and the vulnerability see . Successful exploitation of CVE-2018-15928 could lead to Arbitrary Code Execution in the context of the current user. Due to RedHat the CVSS3 Base Metrics is CVSS:3.0/AV:N/AC:L/PR:N/UI:R/S:U/C:H/I:H/A:H with a CVSS3 Base Score of 8.8. Zero days are not a rare phenomenon. Between 2013 and 2017 about 60% of the exploits were disclosed before the related CVE was published. For about 20% of vulnerabilities in the NVD exploits are published in the exploit database. Only about 1% of the vulnerabilities are exploited in the wild. Thus CVE-2018-15928 is a really rare event. Remote code/script execution (RxE) vulnerabilities like CVE-2018-15928 represent about 20% of all vulnerabilities. 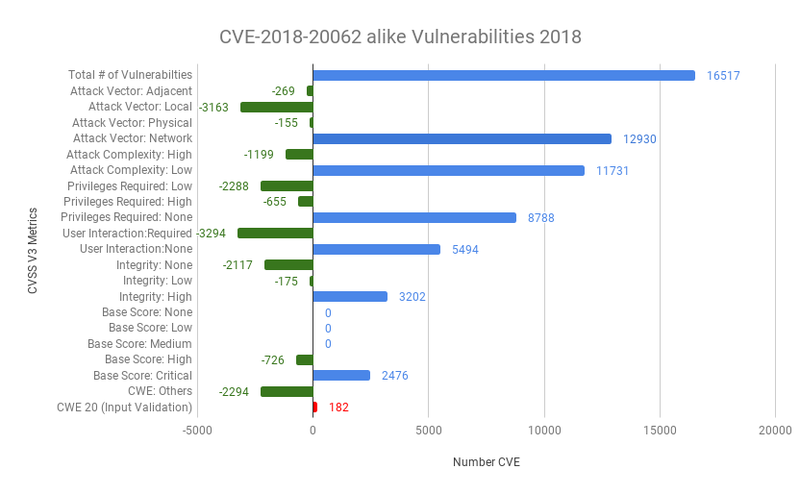 43% of the exploits published between 1988 and 2018 are related to RxE vulnerabilities. 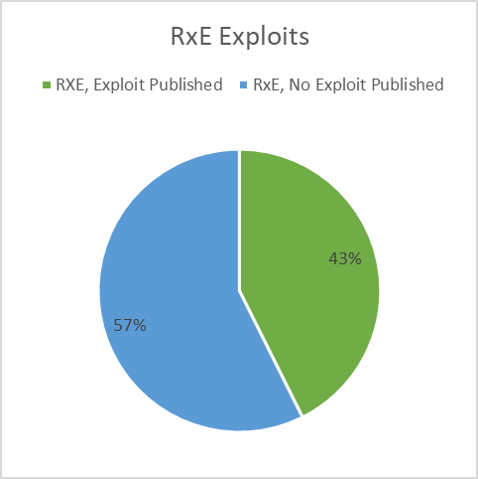 About 5% of the RxE vulnerabilities are exploited in the wild. 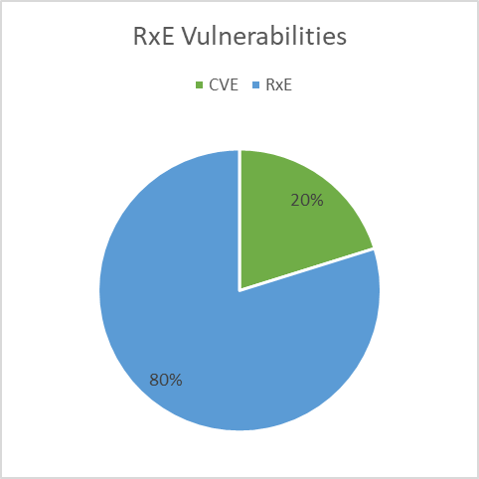 This means, that RxE vulnerabilities are 5 times more often exploited in the wild then Non-RxE vulnerabilities. They are hacker’s favorites! What does the mean for our vulnerability management strategy? The remediation process must be started directly upon publication of an RxE vulnerability in the NVD or the disclosure of an exploit for an RxE in the exploit database. In scope for the first remediation wave must be at least all systems facing the internet, e.g. workstations, servers in the DMZ or in public clouds. Gathering intelligence about new vulnerabilities from a plethora of publicly available sources (OSINT) is a time-consuming task. A threat intelligence service can speed-up information gathering and reduces the workload of your IT security staff. In addition, since remediation takes some time, it makes sense to invest in means for enhancing the resilience of application systems. This entry was posted in Advice for SMEs, Opinion, Survival tips and tagged Adobe Flash Player, CVE-2018-15928, Exploit in the Wild, OSINT, Remote Code Execution Vulnerability, Threat Intelligence, Vulnerability Management, Zero day exploits, Zero-day Malware on December 8, 2018 by Klaus Jochem. Lindsey O’Donnell’s report “Two Critical RCE Bugs Patched in Drupal 7 and 8”  published yesterday on Threatpost gives website operators every reason to enter panic mode. The vulnerabilities are not published in the NIST NVD yet, but Drupal released two security advisories   with details. Why panic? In the past 16 years 177 vulnerabilities  related to Drupal were published. That sounds like a lot but consider that 1,075,609 websites were powered with Drupal core in October 2018 . Fortunately, only 13 exploits were published since 2002. On 29 March 2018 the remote code execution vulnerability CVE-2018-7600 (Drupalgeddon2) was published. Within 20 days after publication three exploits were available. Thousands of sites were compromised in the aftermath. CVE-2018-7602 (Drupalgeddon3) was published on 19 July 2018. In this case exploits were available 81 and 86 days before the CVE was published. Table: Drupal Exploits since 2010. Click to enlarge. The table above shows the vulnerabilities with published exploits for the Drupal CMS since 2010. Negative values in column Number of days exploit published after CVE published indicate that the exploit was published before the CVE was published. These are the magic zero-day exploits, the worst-case scenario for website operators because a warning time does not exist. Except of the green highlighted exploit all exploits were used in the wild, means, they were used in attacks. In addition, except of the green highlighted exploit all CVE were remote code execution or injection vulnerabilities. that if exploits are published, they will be published before or at the day the CVE is published. With this, website operators must directly patch once they become aware of a new remote code execution vulnerability. In addition, I would recommend to take additional preventive measures, e.g. to implement a Web Application Firewall or a Host based Intrusion Detection/Prevention System to make the installation more resilient against new vulnerabilities. If the website is operated on Linux it makes sense to activate AppArmor . This entry was posted in Opinion, Survival tips and tagged AppArmor, Drupal, Drupalgeddon2, Druplageddon3, HIDS, Remote Code Execution Vulnerability, Web application Firewall, Zero day exploits on October 21, 2018 by Klaus Jochem. Two messages this week showed that there is no cure in sight for the fatal disease called digital carelessness. ONE: Two remote code execution (RCE) vulnerabilities found in certain HP Inkjet printers (1). This sort of vulnerabilities is particularly popular in the cyber crime scene because they are network exploitable (Attack Vector AV:Network), attack complexity is low (AC:L), no privileges required (PR:None) and no user interaction is required (Ui:None). Under normal conditions, Inkjet printers are operated inside the company network. Thus there is no need to enter into panic mode because the vulnerability can not be exploited from the internet. Unfortunately, some HP Inkjet printers are, for whatever reason, accessible from the internet. A Shodan search reveals that 539 HP DesignJet printers are directly connected to the internet. One of the vulnerable printer models is the HP DesignJet T520 24-in ePrinter, Product number CQ890A, Firmware version 1829B. For a complete list of the affected printers please see the HP Security Bulletin HPSBHF03589 (2). HP DesignJet T520 Map. Click to enlarge. As of today, 79 printers of this type are directly attached to the internet. Some of them are ready for printing and with this prone to CVE-2018-5924 or CVE-2018-5925 because the HP JetDirect Line Printer Daemon port 515 is open. But why should an attacker exploit these RCE vulnerabilities if he can hijack the printer because basic security is not configured? to close unnecessary open ports. Taiwan Semiconductor Manufacturing Company (TSMC), the world’s largest makers of semiconductors and processors, was hit by a variant of the WannaCry ransomware last week. According to TSMC, its computer systems were not directly attacked, but instead, were exposed to the malware when a supplier installed corrupted software without a virus scan. It doesn’t matter how often installations went well in the past. It’s always the next installation that counts. This entry was posted in Opinion, Survival tips and tagged HP Inkjet Printer, RCE, Remote Code Execution Vulnerability, Taiwan Semiconductor Manufacturing Company, TSMC, WannyCry on August 12, 2018 by Klaus Jochem. 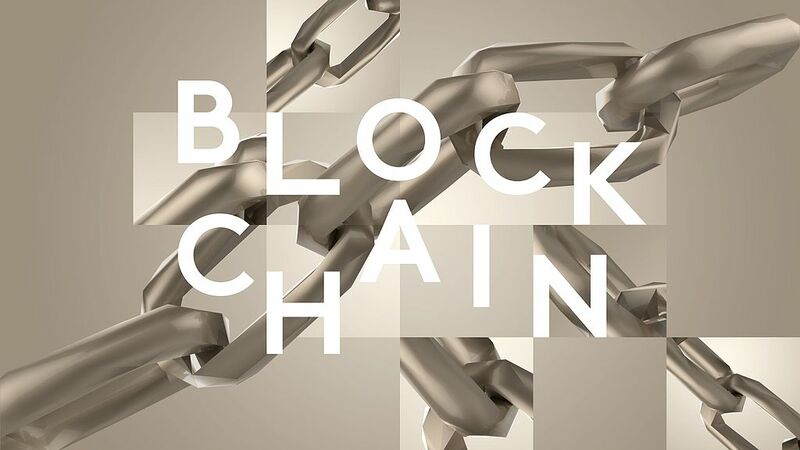 Blockchain technology is a digital platform for applications where seamless traceability and full transparency is required. For example, in pharmaceutical industry blockchain could give full traceability of drugs across the entire supply chain up to the patients. Another interesting application is mobile voting. From the Brookings publication “How blockchain could improve election transparency” (1) on the use of blockchain for internet voting in the West Virginia primaries in May this year we learn that “all data of the election process can be recorded on a publicly verifiable ledger while maintaining the anonymity of voters, with results available instantly”. Unfortunately, every software has bugs. On May 28th, 2018 Swati Khandelwal reported in “The Hacker News” about a remote code execution (RCE) vulnerability in the blockchain-based EOS smart contract system (2). Although it is not clear whether the voting system used in West Virginia is based on the Blockchain 3.0 platform there is urgent need for action. EOSIO set up a bug bounty program (3) to improve their code. But should we rely on bug bounty programs for such important issues like elections or patient safety? From the Qihoo 360 security researchers report (4) we learn that the vulnerability is created by “a buffer out-of-bounds write” error. This means that this vulnerability could have been avoided by performing a static code analysis prior to release. The big question is: How many errors of this type are still included in the blockchain infrastructure? A bug bounty program is a good approach to improve security, a static code analysis is indispensable in my view. In particular when the outcome of an election can be influenced or patient safety is endangered. This entry was posted in New Technology, Opinion and tagged Blockchain, Internet voting, Pharma supply chain, RCE, Remote Code Execution Vulnerability, Static code analysis, Track and Trace on June 3, 2018 by Klaus Jochem. With the increasing adoption of cloud services, the traditional perimeter security approach becomes less and less effective. The on-premise security layer, which protects users against cyber-attacks, is just no longer existent if users have direct access to a company’s cloud services from any location, at any time and, in the best case, from any device. The four “A”s, Authentication, Authorization, Administration and Audit, become more and more important in a [hybrid] cloud based working environment. The magic word is “right”: With IAM we control the access of well-known groups of people to well-known resources. Unfortunately, cyber attackers do often not belong to these groups. 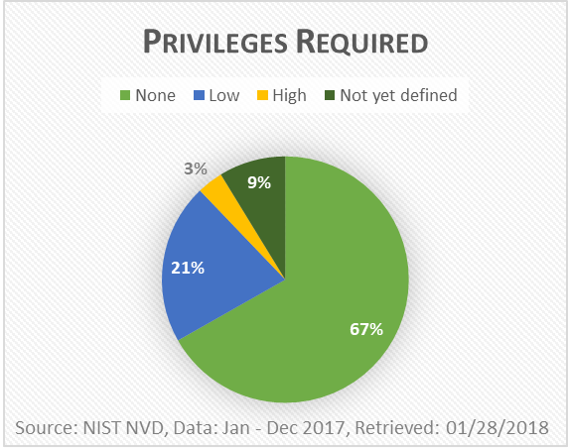 From the NIST NVD we learn, that 67% of the vulnerabilities published in 2017 need no privileges for exploitation. Identity becomes an important part of a new perimeter but can never replace the perimeter. 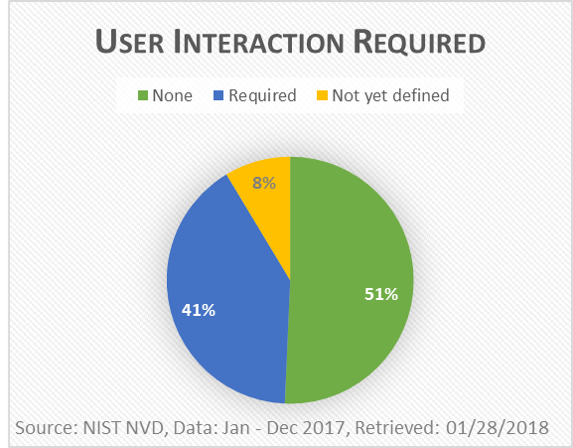 The NIST NVD data give another important insight for shaping a company’s security strategy: In 41% (5958) of 14647 vulnerabilities the user must interact with the attacker for their exploitation. This means that well-made user awareness training can prevent lots of cyber-attacks. This entry was posted in Opinion, Survival tips and tagged IAM, Identity, Identity and Access Management, Perimeter security, RCE, Remote Code Execution Vulnerability on January 28, 2018 by Klaus Jochem. Section Exploited Vulnerabilities of the Recorded Future Cyber Daily is sometimes really frightening. On November 9th, 2017, 249 successful exploits of CVE-2012-1823, a vulnerability in PHP, were recorded. This is hard to believe because CVE-2012-1823 was published on May 11th, 2012. Although a patch was available at the date of publication, it seems that the operators of this systems were not able to implement them within the past five years. However, it would have been of urgent need in this case. CVE-2012-1823 is a so-called RCE (Remote Code Execution) vulnerability, which allows remote attackers to execute arbitrary code on a victim’s computer, and, in the worst case, to hijack the victim’s network. If an application system is operated in the DMZ, critical vulnerabilities must be patched directly upon publication to prevent attackers from getting onto your network. Or at least, between the time of publication and an exploit or proof of concept shows up. Since examples of how to exploit this PHP vulnerability were available in early May 2012, immediate action was required. The big question is: Why were this vulnerable PHP versions not directly patched? 47% of successful exploits use five or more years old vulnerabilities. 68% of successful exploits use three or more years old vulnerabilities, 47% of them were critical vulnerabilities. Stuxnet, CVE-2010-2568, was used in 29% of successful exploits. An analysis of the critical vulnerabilities by vendors shows, that more critical vulnerabilities were found in non-Microsoft products than in Microsoft products. 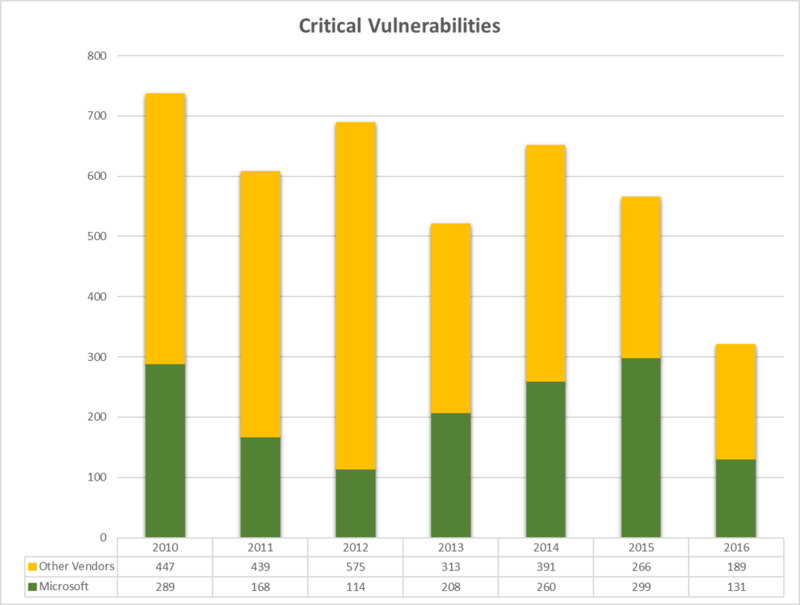 Critical vulnerabilities 2010 – 2016 by vendors. Click to enlarge. But automated patch management is only available for Microsoft and few of the other vendors’ (e.g. Adobe, Oracle, SAP) products. Thus, we can expect that many critical vulnerabilities remain unpatched, which results in an ever-growing pool of opportunities for cyber criminals. 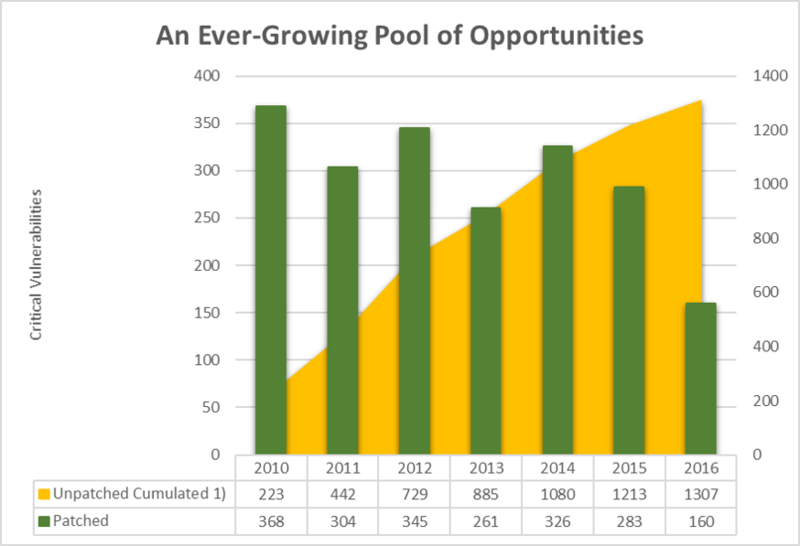 An ever-growing pool of opportunities. Click to enlarge. 1) For the chart above I assumed that 50% of critical vulnerabilities remain unpatched. This assumption is based on the analysis of the 2017 NIST NVD data as of August 31st, 2017. Since no automated patch management exists for PHP we can expect, that CVE-2012-1823 was rarely patched. But the worst is yet to come: From the HPE 2016 Cyber Risk Report we learn, that even six years old Microsoft vulnerabilities (Stuxnet, CVE-2010-2568) are not patched. How to tackle this issue? From my point of view, the cause is compliance driven security. We often do patching of everything to meet compliance with a certain standard, instead of focusing on the real important issues, e.g., the critical vulnerabilities. Or, in other words, we close a lot of mouse holes while the barn door remains wide open. WIth this, we must move from patching to vulnerability management, and priority patching for the critical vulnerabilities. Through a differentiated inspection of vulnerabilities we get out of the patch treadmill and can start working on the important cyber security issues. By the way, if you haven’t subscribed to the Recorded Future Cyber Daily yet, consider to do it this week. This entry was posted in Advice for SMEs, Opinion, Puzzling discussions, Survival tips and tagged Compliance driven security, Critical Vulnerabilities, CVE-2012-1823, National vulnerability database, PHP, Priority Patching, RCE, Recorded Future Cyber Daily, Remote Code Execution Vulnerability, Stuxnet, Vulnerability Management on November 26, 2017 by Klaus Jochem.